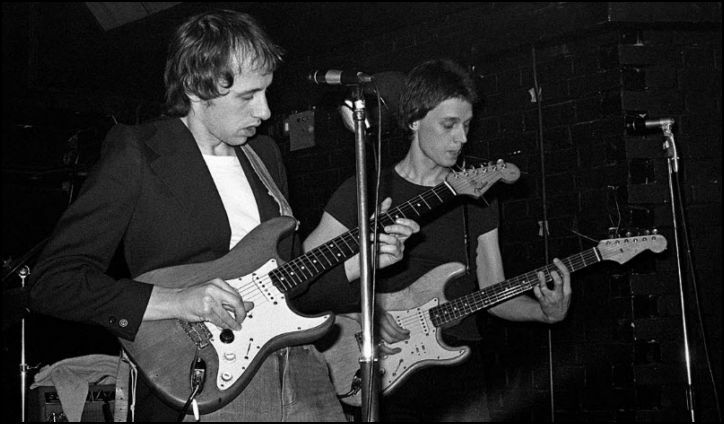 Today I found a picture showing Dire Straits live in 1977, before they recorded their first album. At this time the famous red ‘Sultans’ Strat was not refinished to red yet but still had the bare wood finish in which Mark got it (probably earlier that year). There are a few pictures around that show the guitar with this finish but all of these are of rather poor quality (and all are only black and white). On only one you can actually see a bit of the wood grain, and this only shows a part of the guitar. This picture now is by far the best available of the Strat with the wood finish. We can see that it already had the black volume knob (or whatever purpose the knob really had). Also it seems that already at this time the middle poti had a knob labelled with volume instead of tone, something you can see more clearly on many later pictures. The picture strongly suggests that the guitar has an alder body (alder was the common wood for a ’61 Stratocaster, but some finishes like e.g. blonde often had ash bodies). It looks as if it is a two-piece body, and the seam is almost in the center, approximately at the height of the d string. Two-piece bodies are very common but the position of the seam varies. The guitar does not look very glossy but I don’t think this allows us to tell if it was some wax&oil finish or clear laquer. Unfortunately I cannot tell with certainty if it already has the DiMarzio FS-1 pickup (the length of the pole pieces is different compared to a stock vintage Strat pickup) but listening to the solo of Eastbound Train from the Hope & Anchor, which was recorded about the same time, suggests that it had. In the background we can see the 1961 Vibrolux and we can clearly see that Mark used the bright channel of the amp. Both channels are basically identical with the exception that the right channel has a treble bleeding capacitor over the volume poti. This capacitor became switchable (‘bright switch’) later (with the introduction of the blackface amps) but on the Vibrolux one channel is without and one with the capacitor. Note that David’s guitar also has a wood finish (and also John Illsley Precision Bass). I am almost sure that both David’s and Mark’s guitars were refinished at the same time (about late summer 1978, David’s guitar became black then). David seems to play an unwound g string as it seems, I remember seing him on some 1978 pictures with a wound g string on his Strat. The vocal microphone seems to be a Sure SM57 (these were dark/silver before they got the dark finish they had later). This mic is normally not used for vocals but Mark did so on many gigs in 1978/79. In fact if you sing at rather low volume, you can get it a bit louder on stage before getting feedback than e.g. the more common Sure SM58. Dire Straits only played a few first gigs in 1977 and these were at only five different venues (Rock Garden, Dingwalls, Hope & Anchor, Champers Wine Bar, Loughton College). I wonder if it might be possible to tell from where the picture is, the wall in the background right suggest a rather small pub but my googling for stage pictures of these pubs was not successful yet, maybe someone else has some idea. Looks like the Hope and Anchor. I spoke to Pick around about the time of Elvis’ death and said I liked “Southbound Again” He looked puzzled and said “Oh, we haven’t done that in ages”! Got to love the earlier pics! So dam great. I think I read some interview where Mark called this one the Sultans Strat (something like “I still have my Sultans Strat”). I think he favoured the maple nec: From the moment on he got it, it was used on maybe 75% of the gigs, and this was the one he e.g. played on important sessions like Slow Train Coming. I tend to think that most of the tracks on Communique are also the maple neck (but this might be totally wrong of course). 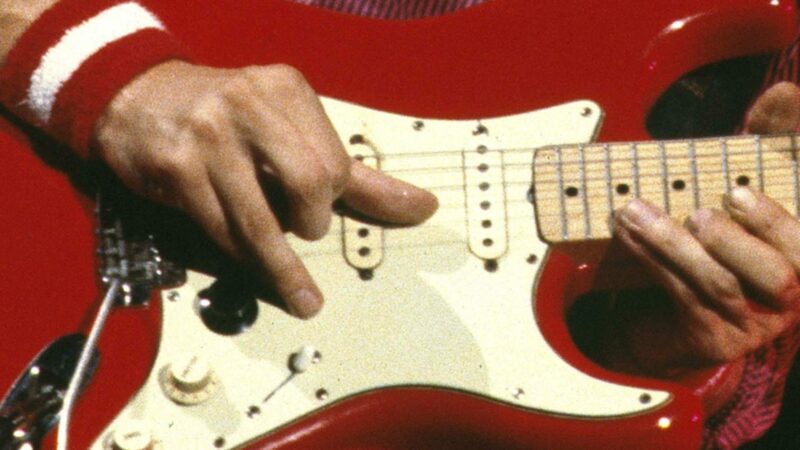 What are the switches on David’s strat? You are right Ingo. Seems or better sounds that there was a maple strat on Communique, it has that cutting tone squashy but it’s so warm that you can imagine a rosewood neck only will do this. (which I think is not necesary of course). When I think ouatitw song my fantasy goes like to mine vintage deluxe reverb with a changed speaker (to which speaker?…) not the original 12k5 I bilieve. Or the wdytyg even a deluxe can do it in this similar tone my mind goes to a twin reverb. Those early tones Ingo don’t you remind a c12n speaker? That is what I think. Also a greenback on some others and I don’t know for a jbl which I have’nt. I \m speaking about cleans only. Anyway…..
Ah ok sorry for my replies Ingo.. You meant Chris Rea use jbl’s back then? ?would like if couldto compare a d120f onthe deluxe to the jensen or greenback. Don’t you the g12m is bit more soft for that trebley clean we talk? The other one I wish I could compare is the brown vibrolux like yours to the bf or sf deluxe reverb…. I remember for sure that Chris Rea used to play two amps on stage in the 80ies: a brown bandmaster head with a I think 2×12 Fender cabinet, and a silver face twin reverb with speakers with aluminium dust cap (you can see these through the grill cloth), and this is normally a hint for JBLs although theoretically there are other speakers with such dust caps of course. I agree with you that JBLs are great for clean sounds but do not have that sweet treble we hear on the DS stuff, they are extremely transparent but easily become harsh because the treble reaches up far over the normal 6kHz of a paper dust cap speaker. G12M are great, so are Jensens, Oxfords, and many more. I am stunned to see Davids Strat as it may well have belonged to me back in the 60’s. I purchased a used early 60’s Sunburst Strat from Bennett’s music in Portsmouth in 1963. I unfortunately scratched it quite badly so I had it refinished in a pale, almost Wedgewood blue by a local kitchen unit manufacturer. That was the colour he was spraying cupboard doors that week and he did a beautiful job on it.. At the time I was an apprentice toolmaker and I was dissatisfied with just having 3 P/U selections so I machined a cut out to accept 3 slider switches which I wired to enable the selection of each P/U providing every possible combination. I actually liked all three on together. I doubt it still exists but I put a piece of paper inside with my name and then address where I lived in Portsmouth. I regrettably sold the guitar in 1968 and have been searching for it ever since. I have old photos of me with the guitar to substantiate my story. If David still has this guitar I would really love to hear from him if he thinks this may be my old axe. Well, that seems to solve the mysery of the sliding switches on David’s scratchplate! 1st law of forensics, “Every contact leaves traces”! Actually Ray, David’s Strat, at least in the above pictures and sources like the Sultans video, looks like it has only two slider switches and a round hole next to them.